1.) 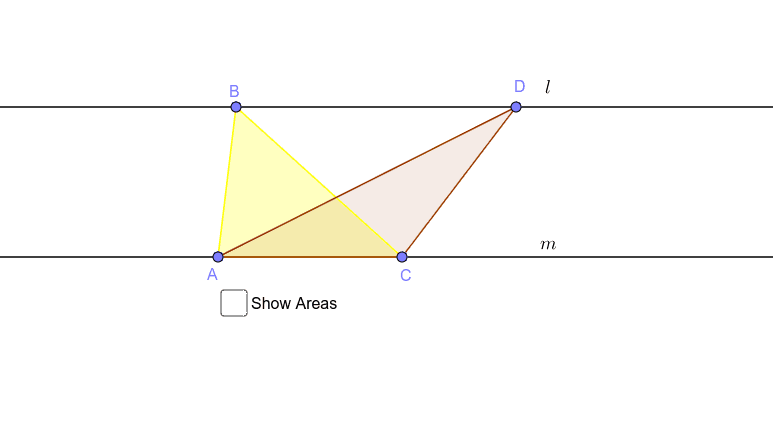 Which of the two triangles has a larger area, triangle ABC or triangle ADC? Why? 2.) Click on the "Show Areas" check box. Was your answer correct? 3.) Move point B or point D. What do you observe about the areas of the two triangles? Why do you think is your observation as such? 4.) Select a new base length by moving point A or point C. After fixing the base length, move points B or D. Was your observation in 3 still the same? 5.) Explain the reason behind your observation in 3 and 4.